Jasper, Indiana, is centrally located in Dubois County in Southern Indiana. Jasper is in Bainbridge Township and is the county seat for Dubois County. Rolling hills, dense forests, and farmlands surround the city limits of Jasper, enabling the perfect balance of urban and metropolitan living in one location. 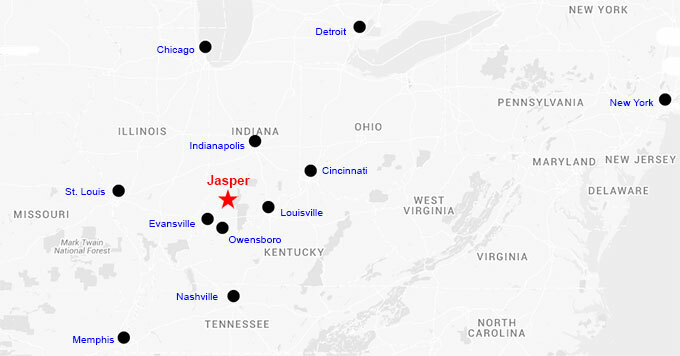 Jasper is located 122 miles south of Indianapolis, 55 miles northeast of Evansville and 79 miles west of Louisville, Kentucky. U.S. Highway 231, State Highways 56, 162 and 164 conveniently run through Jasper promising easy access from Interstate 64 and neighboring towns. Interstate 64 is 12 miles south of Jasper, connecting the route eastward bound to Louisville, KY and Cincinnati, OH and westward bound to Evansville and St. Louis, MO. Interstate 69 is 15 miles west of Jasper – making the trip to Evansville and (soon to be) trip to Indianapolis more convenient. 452 to 610 feet above sea level. Jasper covers 9.59 sq. miles. Dubois County covers 536 sq. miles.